Ian Ruhter photographs the United States’ natural wonders and national parks with his truck as his camera. Find out how—and why Yosemite National Park is so special. At a time when images can be made as a passing thought with your mobile device, taking a moment, or many moments, to pause and truly see a place has become a rarer art form. A few years ago photographer Ian Ruhter decided to put a pause on his work in digital and commercial photography and reassess how he was making pictures. Since then, he’s been making wet plates—a photographic process that originated in the mid-19th century—using a historic and slow process. Traveling across the United States, Ruhter has slowed down to capture America’s parks and great outdoors, creating a dual vision—at once of the present and past. In celebration of the 2016 National Park Service centennial, we sat down with Ruhter to discuss his work and making wet plates in Yosemite National Park, one of America’s most majestic national treasures. “While we were making these plates, a tour bus driven by a Yosemite park ranger pulled up. She recognized who we were and was so excited she ended up giving a tour of our process and the camera truck,” says Ruhter. “It was a real struggle trying to line the shot up. Because we can't move the truck around like you would a normal camera, you have to improvise,” says Ruhter. “I ended up making a tighter shot of the falls than I originally intended on. Looking at it now I am really happy that I have an intimate close-up photo of this beautiful landscape." 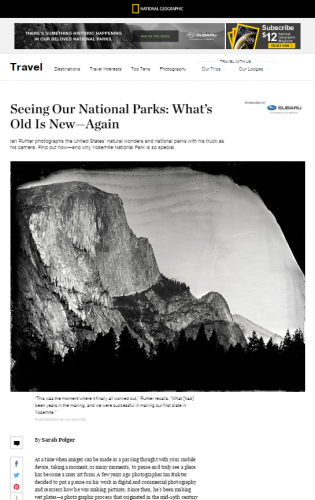 Of all the places you've made wet plates, Yosemite stands out as special to you and your work. What about this national park was so impactful to you? I started to fall more in love with Yosemite after I learned about the works of Carleton Watkins, one of the first individuals to photograph the West. He spent a large portion of his career making wet plates in Yosemite. His images illustrated the beauty of the land and became the first significant photographic record of Yosemite. These images inspired politicians and others from around the nation to lobby to protect the park. After this, in 1864, Abraham Lincoln signed the Yosemite Grant legislation that led to protecting the nation’s parks and paving the way for the national park concept. Learn more about how Ian Ruhter created giant wet plate images, using his truck as a camera, in Yosemite National Park. Watkins was pushing the limits of photography and was on the forefront of art, science, exploration, and preservation with the making of his mammoth-size plates. I wanted to experience Yosemite like Watkins, pushing photography the way he did. My dream is to create the world’s largest wet-plate collodion image in this park. On my first attempt I failed miserably. However, that gut-wrenching failure, I realized, was something that Watkins experienced over and over in life until the end. I believe now that’s the closest I will ever be to feeling what he felt. Tell us about what brought you to create this kind of work. Why wet plates? I had been working as a commercial and editorial photographer for many years when the digital image-taking process came along. I was forced to work exclusively in this medium if I wanted to keep the existing jobs and clients that I had. Many of these jobs and clients were also forcing my hand to start manipulating my own images. Overnight I was spending more time altering images. I felt like I was trying to keep up with the Joneses and not doing photography.. This led to a moral question: Does the altering of images contribute to the acceptance of human beings altering their own bodies to keep up with the demanding pressures of our society? As I was altering these images I realized that I was becoming part of this system. It became apparent that my photography was being used toward something very negative for humanity, and I didn’t want to be remembered for that. I did quite a bit of soul searching. During my search I found the wet-plate collodion process. This process allows you to make direct positives either on glass (ambrotype) or metal (tintype) plates. It allows you to create your photograph inside the camera. Once you coat and sensitize your glass or metal plate with the collodion liquid film, you then make an exposure that’s from a few seconds to minutes. Once this exposure is made you immediately develop the image. What is on the plate will be on there forever. There is no way to manipulate these photographs. I fell in love with being able to tell the truth through my photography. Ian Ruhter and Will Eichelberger look out from inside the camera truck they use to create their giant wet plate photographs of Yosemite National Park. It took an entire day to create these three 27-by-35-inch tintype exposures. Only one of them was of acceptable quality for Ruhter. Ruhter holds a 24-by-30-inch tintype of Yosemite Falls in front of the falls. The waterfall is so large that he was only able to capture the top portion of it. In the future, he hopes to make the world’s largest wet-plate collodion from this location and capture the entire waterfall. People gather at the Yosemite Valley Campground for an exhibition of the work Ruhter captured in Yosemite. The wet plate process is not quick. How has this slow process changed your experience of a place when photographing? This process is so incredibly slow. I usually set up early in the morning and I'm putting everything away as the sun is going down. It allows me to really experience the location that I'm photographing. Being able to watch the light change and move across the land, bringing things in and out of focus and revealing things that you never knew were there. What's unique about creating this type of work in Yosemite? What are the biggest challenges? Watch and learn more about Ian Ruhter's photographic process. What is unique about making plates in Yosemite is they stand as a testament of time. I realized that I could reference a plate from 1865 and look at a plate I created in 2016 and see that very little has changed. It is an authentic image. One of the biggest challenges while working with the wet plate process is that it takes an entire day to set up with the hopes of making one single image. The most challenging part of my process in Yosemite was trying to make plates that were significantly larger than what Watkins had created. He was an expert in this process and I had only, at the time, been doing this for one year. The challenge was also learning to be patient and realizing that these failures were part of the process. It took me two years to build up the courage to return to Yosemite and try again. Tunnel View is one of the most crowded locations in Yosemite; on any given day you will see hundreds of photographers lined up here. It was a challenge for Ruhter just to find a place to park the camera truck. “We finally found a spot way off to the side. As I was looking at this location, it lined up perfectly with the tree in the foreground. I took this as a sign from Watkins. The shot has a striking resemblance to his famous photo from this view,” says Ruhter. I remember while we were setting up to make our first image I literally felt like I was going to throw up, because I was so nervous. Once the plate was exposed and developed I watched the image clear in the fixer and I knew that I had successfully made my first wet-plate collodion image in Yosemite. I felt more proud of myself for having the courage to try again. You've had to travel extensively, driving, to create your work. Has that travel experience impacted your work and way of approaching a place? There is something to be said about traveling by automobile. The idea that you can change direction in a blink of an eye is a remarkable thing. It can also lead you down some roads where you begin to feel incredibly lost. The idea of losing your way in order to find what you're looking for is an incredible feeling. Does making wet plates force you to see a place differently? The process of making plates doesn’t necessarily allow me to see things differently. Because I have converted a giant truck into a camera I actually work inside of the camera. Seeing the world through a giant lens allows me to experience the world in a new way. In light of the centennial of the National Park Service and all the time you've spent outdoors to create your work, what comes to mind thinking about all those experiences and your travel to these different places? I am grateful that individuals dedicated their lives and made efforts to preserve these lands. These experiences have allowed me to see how important the preservation and access to these lands for generations to come truly are.